Pictures of a must-have novelty have been popping up all over Java-related web sites recently, including on James Gosling’s blog. Duke briefly introduces the inventor, Kazuhiro Kazama, and mentions Kazama-san’s activities around Project Looking Glass. But what Duke forgets to tell us is that he and Kazama-san have been friends for a long time. Kazama-san has helped Duke on two expert groups, JSR 51 (New I/O APIs) and JSR 204 (Supplementary Character Support). He has translated and improved the one and only Java Internationalization book into Japanese. He’s a driver of Ja-Jakarta, the Japanese group of users and developers of Tomcat and related technologies. And he’s always ready to provide Duke and his helpers with advice, in particular on the needs of Japanese developers. 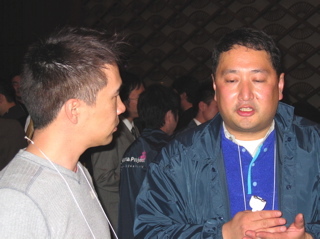 Here he is, discussing servlet character encoding issues with Servlet specification lead Yutaka Yoshida at the Java Technology Conference in Tokyo, February 2004.